Are you bogged down with too much email? If you’re inbox is like most, you are probably screaming a loud “Yes!” at the computer right now! We can waste hours a day reading about things we don’t need to read and responding to emails that don’t need a response. Until a few months ago, I was overwhelmed with email too. That is, until I started processing my email in a new way. The first thing I did was sign up for Unroll.me. It’s not the only thing I did, but it’s the only thing we’re going to cover in this post. Here’s a quick rundown of how it works. Connect Unroll.me to your email account. Unsubscribe from newsletters you no longer need with one click. “Roll up” newsletters you want to keep receiving but don’t need to see the moment they are sent. Receive ONE email each day containing a daily digest of those newsletters. Enjoy a clean inbox that only has emails you absolutely need to see. Which emails do I rollup? You can roll up all kinds of emails, but I mostly use it for store newsletters and social sharing sites. I didn’t want to unsubscribe from store emails because I have growing boys! They’re outgrowing clothes by the second. So when I finally decide their highwaters are just too high, I like to use the latest coupon and save some cash! I didn’t want to unsubscribe from social sharing sites because I like to be notified when you guys respond on Facebook, twitter, and G+. I may not be able to respond right away, but knowing you are asking/answering questions helps me pop on over to those sites once a day. As I sign up for new store newsletters or start participating in another social sharing site, Unroll.me gives me a heads up on the daily digest email. I click the link and in two seconds I move the new emails into the system. Super simple! Now this isn’t the only way I’ve simplified email. But it’s the first step. 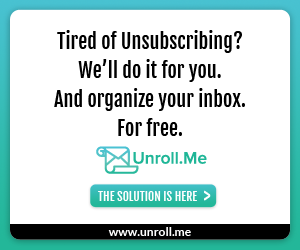 Try Unroll.me for yourself and let me know what you think! Thanks for this! I am so glad to have it!! !